As a high school teen when this came out, already enamored with rock and only fleetingly acquainted with its “folk” variety was I. 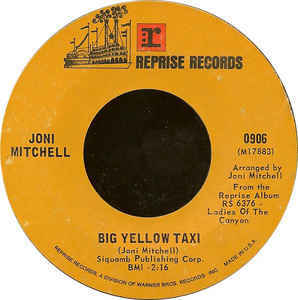 Found myself figuratively run over by Joni’s “Big Yellow Taxi”. Maybe it was due to my favorite band breaking up at the time1 that I inexplicably sought something different; the kind of thought that enabled this album to come into focus. Brought another of the southland’s “canyon” communities that ring our basin into view; and this time, it wasn’t blood-drenched2. Didn’t sound like anything I’d heard to that point, and voiced with an uncommon grace and wit by that “lady in the canyon” even those Led Zeppelin’s turntable sessions in my room couldn’t drown out. Would take a while, along with getting my driver’s license, to familiarize myself with the Laurel Canyon she described. What was the center of popular music culture in Los Angeles during the 1960s3 so formative to my youth, and only now was learning of. Funny how it works that way. 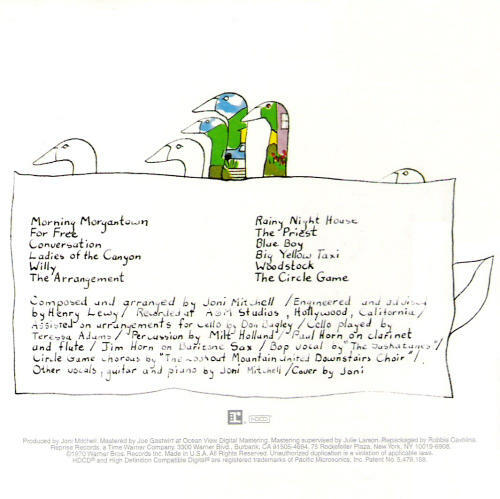 Its album cover notable not only its clean simplicity and line art but the fact that Joni Mitchell designed it herself. Maybe because she lived there and so associated with the scene, she could capture a bit of its essence within a hand-drawn self-portrait, splashes of watercolor, and a whole lot of white space. Corral the left corners of that paper board gatefold cover4 in the same way as that rustic setting did within the urban sprawl of a city that knew few bounds. Offering a glimpse of a musical and cultural haven that’d be almost as fleeting.